Stone has been used for building purposes through all times wherever it is easily available in manageable pieces or of such quality that is easy to work. Stone constructions are generally durable—and even if they fall, the material will bear the evidence of human activity virtually forever. Gotland and Estonia have soft lime stone easily available and in abundance while there are only hard stones and a very hard bed rock in the Finnish ground. This is why stone structures are relatively few in Finland compared to the neighbouring countries where the tradition lives on, particularly in restoration activities, but also to some extent in new buildings and walls. The building technique developed through times from simple pre historic dry laid walls to the soaring structures of cathedrals and towers in the Gothic times and after. 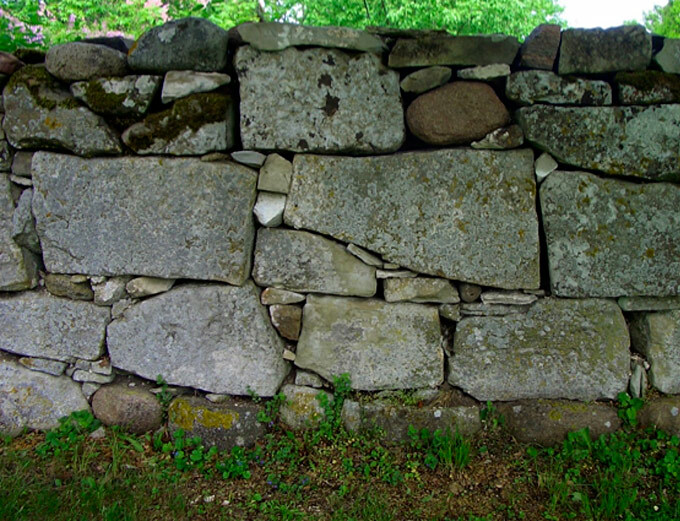 Random size stones are piled on top of each other (this is how Gothlandic garden walls are made still today and this is how 1–2 storey buildings are made with the addition of rendering on each side of the wall). Blocks of stone are cut in precise pieces and piled on top of each other rather like huge bricks (e.g., Egyptian and Greek temples were built like this). Two walls are built next to each other and the cavity is filled with tightly packed rubble and mortar (the Romans built like this and so did the Mexicans and many others. Indeed, this was the most common way of building big stone structures like temples, cathedrals or defensive walls until the turn of the 20th century). 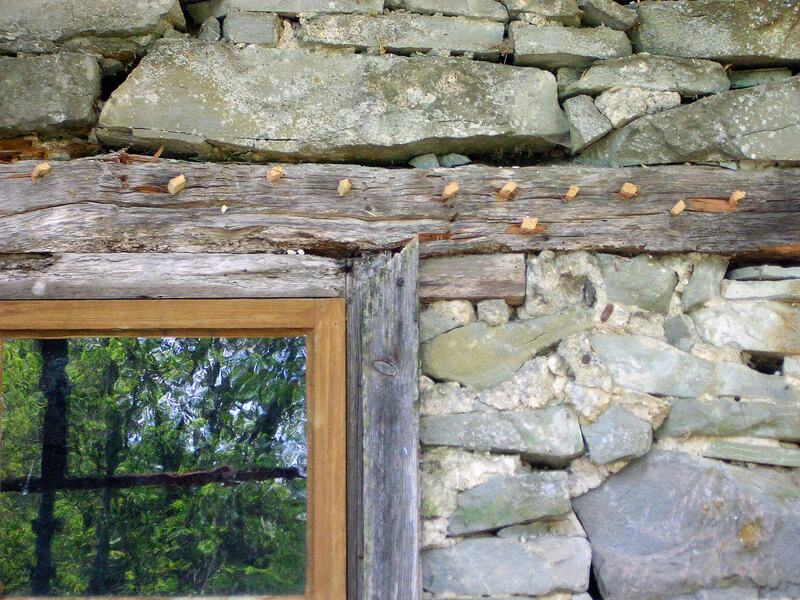 In modern stone walls the stone is used as cladding only. 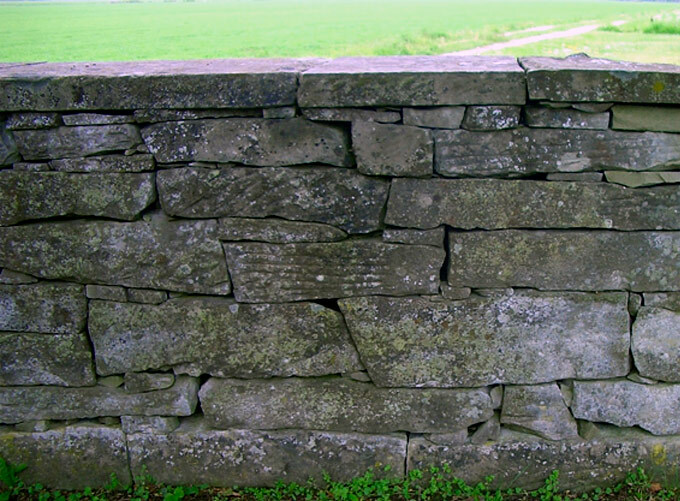 These cannot be called real stone walls as the slabs of stone are attached on structures of brick, concrete or steel by metal ties and have only a decorative function. The dry stone structure of a two storey Gotlandic vernacular house is revealed when the rendering has been stripped (image 1). The ruins of the 12th century church at Roma Kloster, Gotland, have walls with double skin of dressed lime stone and a core of stone and mortar (image 2). 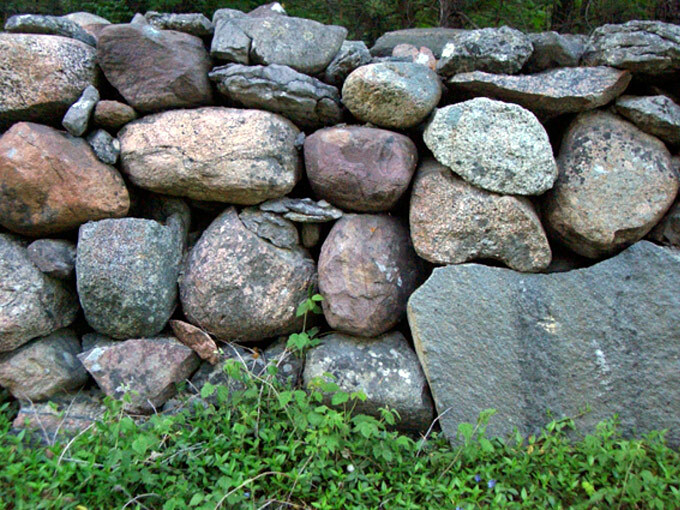 The stone walls that crisscross the Gothlandic landscape vary according to the available stone: wall of random granite boulders (image 3); wall of left over pieces of dressed stone—note the small stone wedges that secure the bigger blocks into position (image 4); and perfect workmanship! Note the recycled ancient pieces with patterns (image 5). The fields of Fide in southern Gotland, Sweden, were the scene for the intensive course Stone Walls (Sustainable Heritage report No. 4) in the autumn of 2012. The intensive course and hands–on work on the Swedish island concentrated on the structural properties and conservation methods of both historic stone buildings and garden walls. 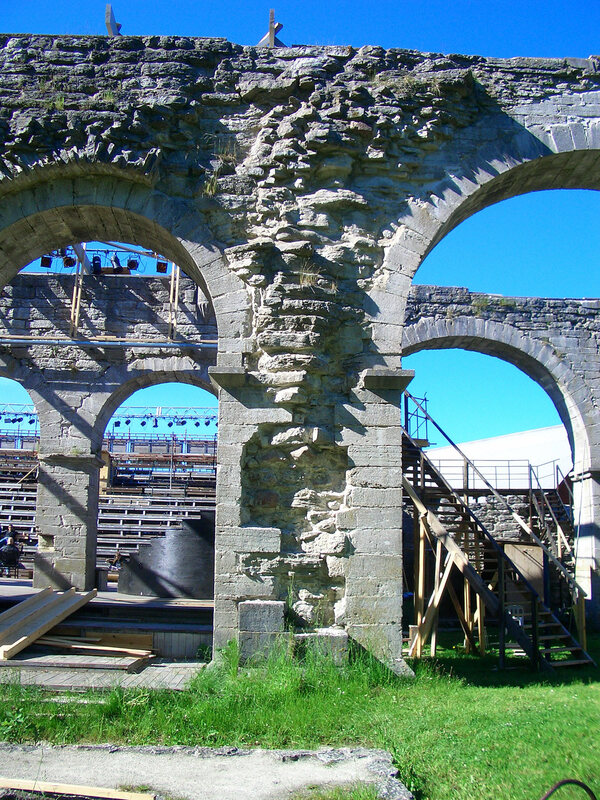 The reconstruction work of the ancient landscape was most rewarding and some 300 meters of old walls were repaired in just three days by enthusiastic students… more documentation, program and images on Hands–On Work in Autumn 2012.